Starve your Addiction. Visit www.overcomersinchrist.org for Christian Bible-based recovery | Overcomers In Christ | Christian Christ Centered Faith Based Recovery The mind is very powerful. Whatever the eyes see, the mind can invite. from people, places, and things that feed your addiction. Before I went sober, I worked a job where they wanted me to stock alcohol several times a week. I saw many different alcohols and always thought how much I wanted to try this one and that one. I’m not kidding you, it was helping feed my addiction. I was friends with people who invited me to go to places with them and drink. I willingly gave myself permission to drink when I was with those people and at those places. I fed my addiction by the influence of others and the places I went. You can feed an addiction before you even know that it’s an addiction. You can start an addiction by the first choice. The mind is very powerful. Whatever the eyes see, the mind can invite. Addiction starts with a choice, but it can be adapted once a choice is made. Where there is an adaption, there is an attachment that becomes an addiction. So, starve your addiction. The opposite of feed, is to starve. Cut out people, places, and things that feed your addiction: A job that is feeding your addiction; “Friends” and family that are feeding your addiction. Anything feeding your addiction must be cut off if you want to fully recover. Unhealthy people, places and things must be replaced with better choices. Harmful people, places, and things were cut off in my life all at once. Although I trust myself now because of the strength I have in Christ, I still don’t put myself in situations to be near alcohol. I would probably never involve myself in a job with alcohol again. I don’t choose to be around people who are drinking. I don’t even go to Christmas parties if I know there is alcohol there. I don’t choose friends who would drink around me. I avoid these things because I respect myself. Recovery has to do with respecting yourself. Sobriety is a way of self-care and involves participating in a recovery group such as Overcomers In Christ. I believe that recovery will benefit anyone who chooses it. Addiction is something very human that anyone can easily fall prisoner to. Many suffer from addiction behind closed doors. Sadly, a lot of people openly invite their addiction. Recovery is a strong and bold choice. It’s not horrible or boring. You can be passionate and joyful in recovery. My faith has helped me towards the choice of sobriety. Which is why I feel like I’ve been strong enough to stay sober. Through it all, God was my rock to stand on, and addiction was the sand that washed away in the storms. 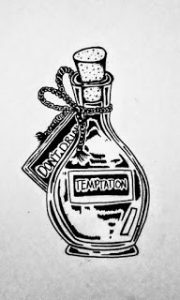 1 Corinthians 10:13 “No temptation has overtaken you except what is common to mankind. And God is faithful: he will not let you be tempted beyond what you can bear. But when you are tempted, he will also provide a way out so you can endure it.” God will help you overcome temptation and addiction if you turn to Him.